I am new to Xamarin and getting started on building an app. I am using XAMARIN.Auth to store the user name and the Token after login. The Auth token on the server has expiration. When the user resumes the app from the background, what is the best practice to see if they need to login or use the existing token? I am thinking of checking the token validation from service. Is that ok? And how is idle timeout implemented? I'm using Xamarin.Auth (https://components.xamarin.com/view/xamarin.auth/) to store my credentials, as I've always done. "Could not save account to KeyChain: -34018"
I was trying to implement login with Google and Facebook. 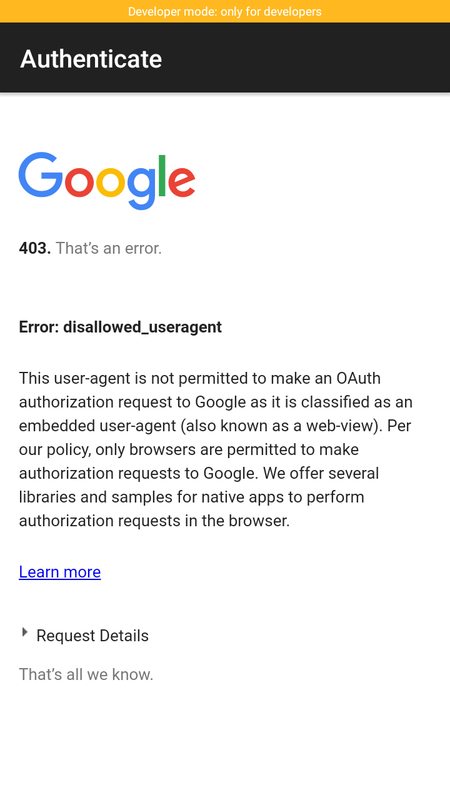 I have successfully implemented Facebook login with Xamarin.Auth but in the Google Login I am getting error disallowed_useragent, I know Google has changed their policy and will not allow the login using WebView but is there any other way to implement Login with Google in Xamarin.Forms (Portable)? In a Xamarin.Forms project and I'd like to use Xamarin.Auth just to store and retrieve Account object securely. Please note that I am not taking about integrating with Facebook, Google or any other service that serves end-to-end oAuth login experience. Is this a case of needing to refresh the token? What am I doing wrong? I am currently using Xamarin.Auth on a iOS project to handle some user authentication via Facebook and Twitter in my application. The Facebook authentication using OAuth2Authenticator works great and my implementation was based mainly off the docs (http://components.xamarin.com/gettingstarted/xamarin.auth). Twitter however still uses OAuth1 it seems and thus I based my implementation mainly off the answer in this StackOverflow questions (https://stackoverflow.com/a/21982205). Everything works properly and I am able to retrieve user, tweets, etc. but after all the code executes I receive a "Authentication Error" popup on the screen saying "Object reference not set to an instance of an object." there is nothing printed to the console however as is the case with most normal errors I have seen thus far. I can dismiss the popup and everything continues to preform correctly. I believe I have narrowed the problem down to something within the OAuth1Authenticator request as I still receive the error when all of the other handling code has been commented out. Please reference the code below to see what might be the cause of this. I'm currently begining to work with Xamarin.Auth and I'm facing 2 problems for which I'm stuck since 1 day and half.. But what about the 2 others? I have them for Google+. I've just updated XCode to the 7.0 (7A220) and this take my Simulators to iOS9. From that moment I cannot perform successfully any OAUTH call from the simulators.. I tried every model, from my App to the "sample Xamarin.Auth App". 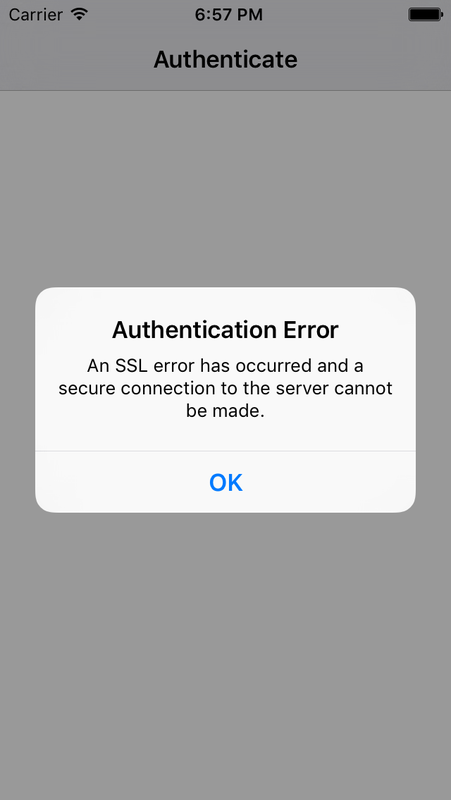 An SSL error has occurred and a secure connection to the server cannot be made"
The Code is the STANDARD one, I only changed my AppID. The same code is working on the Android version of the same App! // If authorization succeeds or is canceled, .Completed will be fired. // We presented the UI, so it's up to us to dismiss it. // Now that we're logged in, make a OAuth2 request to get the user's info. The IOS9 Simulator can surf the web, so it is not a "connectivity problem". I also tried with Facebook SDK, same error. Could it be a certificate issue? Using Xamarin.Auth for OAuth2 authentication - username and password? I'm facing some issue, while using Xamarin.Auth for OAuth2 authentication. however message it's beeing send in wrong way - at least I think so, as there is no Authorization in header + I haven't see any possibility to pass username and password into OAuth2Authenticator. Does anyone have idea, how I can do this? Or should I use something else - not Xamarin.Auth? I am currently trying to use a REST service inside a xamarin.forms app. As far as I understood the documentation of xamarin.auth this will trigger the OAuth1Authenticator to parse the resulting url to get the authenticated user's credentials, and ultimatley triggering the Completed or Error event. But suprisingly nothing happens: no event is called or error raised. As this makes debugging harder, I do not really know how to solve this issue. Therefore, I am looking for suggestings about the cause of the issue and possible solutions, too. Edit: Just to make this clearer: The OnCreate method of the intent is called, but executing the OnPageLoading method does not raise the Completed nor the Error event of the authenticator. Edit2: here is the code of my callbacks (I created a breakpoint inside each of them, and the debugger does not break at them or raise an exception, so I am quite sure, that the callbacks are not called at all). When i try to retrieve the refresh token in the same way i retreive the access token it does not work. i am able to get the access token but not able to get the refresh token. I have tried deleting authorization from the google account because i read that you only get the refresh token the first time you grant access but i still cannot retrieve the access token. I have also read that i need to add access_type=offline and approval_prompt=force to the request but i do not know where to add it using xamarin.auth. I'm using Xamarin.Auth to authenticate with services like foursquare and so. I've gotten my authentication code working all good, the problem is that the account data is not persisted when I deploy a new version of my app - each time I deploy a test version on the phone, I've to re-authenticate. if (!eventArgs.IsAuthenticated) // make sure we are authenticated. Xamarin.Auth Android project results in "Cannot find symbol" error for CustomTabs? Portable Bait And Switch is nuget feature, so the package must be installed in all project. NotImplementedException will indicate that Portable Code from PCL is used and not Platform Specific implementation. Please check whether platform specific Assembly is properly installed. There are 6 of these errors in all, each one related to CustomTabs in some way. I've done some research on this problem in the Xamarin forums, here on Stack Overflow, and of course Google but none of the suggested fixes I found is solving my problem. I am completely confused as to what could be going on here. Am I missing the obvious? I'm building an app as Trakt client using Xamarin. To authenticate users, I use Xamarin.Auth because its cross-platform. However, after the authentication succeeds, it doesn't call Completed event handler. The event is only called once I click on the Back button but it returns a null Account object and false IsAuthenticated. I'm wondering if its because the redirect uri is invalid.